Didier Aumilie is a Breton commoner and ship's clerk, currently residing at The Count's Arms in Anvil. He claims to live the sweet life enjoying the pleasures of the Gold Coast, but he never sets foot on the dockside and spends all of his time relaxing inside Anvil. He sleeps in one of the private rooms on the second floor of The Count's Arms every night between midnight and 6am, then goes downstairs to hang out with innkeeper Wilbur and the other regulars. At 8am, he finds a chair and enjoys a two-hour breakfast. He leaves at 10am and spends the next four hours relaxing in one of the chairs in the small arrangement outside the inn. 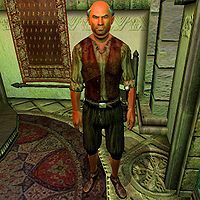 At 2pm, he gets up and heads inside for yet another two hours of hanging out, before heading to the Chapel of Dibella to receive a blessing from Stendarr. After sitting on the pew for four hours, he returns to the inn at 8pm. At 10pm, he picks out a bottle of wine from Wilbur's collection and enjoys it until his bedtime at midnight. On rainy days, he will cancel his relaxation outside the inn and patiently stay inside until it clears up. When the Knights of the Nine plug-in is installed, Didier will change his behavior slightly. Instead of going to the Chapel at 4pm, he will instead stop and listen to The Prophet for four hours. After Knights of the Nine is completed, he will return to his usual routine. He wields an iron dagger and wears a set of regular lower class-clothing: a patched vest, a pair of breeches and stitched leather shoes. He also carries a small amount of gold. When you meet him for the first time, he will politely introduce himself: "Didier Aumilie, ship's clerk. At present, I'm spending my time and gold on the pleasures of the Gold Coast." He also tends to get quite philosophical about the sea trade: "Many of Anvil's folk are directly or indirectly associated with ships and sailing… sailors, ship-owners, men made rich and poor by the sea trade, and the lonely wives of men who follow the sea." He is referred to as Imperius Vercetii by game data. When Didier receives his blessing from Stendarr, he will always stand in the middle of the chapel. As a result, the blessing will just fly across the room instead of hitting him. Although the subtitles read "Have a good day now" when exiting conversation with him, he actually doesn't say anything at all, nor do his lips move. This page was last modified on 20 May 2018, at 06:29.